The Auto Rider is equipped with various technical features, including Basic visual navigation and Differential Global Positioning System (DGPS). 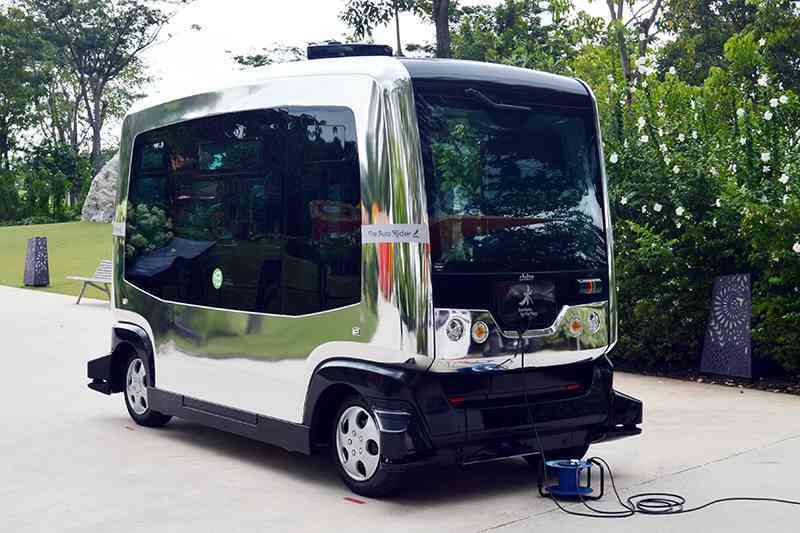 From 1 December, public trials of Asia’s first fully operational Autonomous Vehicle (AV), self-driving vehicle, will be running at Gardens by the Bay. The AV is adjacent to ‘The Future of Us’ exhibition and visitors to the Gardens can request to ride the AV on a first come, first served basis. The Auto Rider is a 10 passenger, fully electric vehicle. It allows for 6 hours operating time or 4 hours operating time with A/C. It takes 7 to 8 hours charging time to power the AV, which can run automatic or manual. The maximum speed that the vehicle can operate is 40 kilometers per hour, putting it at half the highway speed for a traditional vehicle. The Auto Rider follows a preset journey set by the operators. The vehicle can go from point A to point B follow a predetermined route, it will not change course. Additional points can be added to the journey by the operators, if desired. The Gardens by the Bay is working their partner to add the following features in the near future: Navigation-technology Sensor Fusion, Radio Frequency Identification (RFID) markers to support navigation, and Outdoor Visual Navigation and Lidar Simultaneous Localisation and Mapping. Unfortunately, the weather did not permit us to ride the AV at the time of our scheduled ride on 1 December. Instead, OpenGov got inside the vehicle and caught up with one of the members of the technical team, to better understand the functions of the vehicle. We were given an exclusive look inside the vehicle, to see what data it is picking up and how it operates on its own. Looking at the data from inside the vehicle, the yellow regions marked in the image above, show the LiDAR features recorded in previous runs. The blue regions signified the rain being picked up by the vehicle sensors. There are 4 sensors at each of the corners of the vehicle. The red squares indicate that there is something close in proximity to the vehicle, this prevents the AV from moving. The green line marks the predetermined route for the autonomous vehicle to follow. The arrow within the square marks the forward-facing part of the vehicle. It is expected that the AV must be improved with further techniques to suit local weather conditions and safely operate in a traffic environment. Visitors can schedule an experience in the Auto Rider after 1 pm, rides commence at 3pm. Tickets are free and given on a first come, first served basis. The AV is expected to be fully operational in mid-2016.